As many of you know, we traveled to Ireland last May. During the two weeks we were there, we captured some wonderful photographic moments. We would like to now share those photographs with the world through our exhibit, Emerald Expressions. We are seeking investors to help us make this possible. Our exhibit will debut at the Ludington Area Center for the Arts in March 2012 and will then part of the exhibit will also be our 2012 Grand Rapids Art Prize entry. Investors may contribute through www.kickstarter.com. This amazing site exists solely for the purpose of helping creative people reach their dreams. 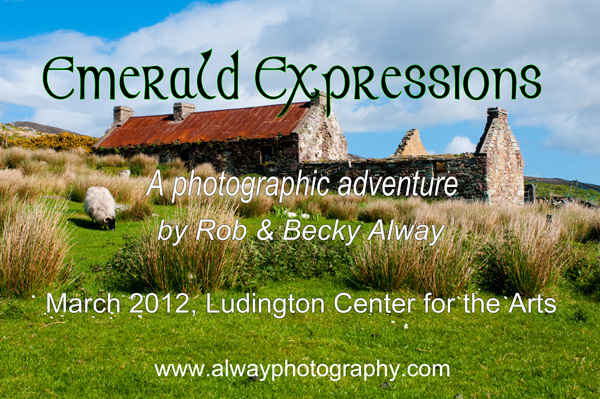 If you would like to help out, please visit our project site at http://www.kickstarter.com/projects/1600163945/emerald-expressions-a-photographic-tour-of-ireland.